Yeah. These are sick. The blue color is pulled directly from the Las Vegas skyline and truly different than anything we’ve seen in professional sports. The “V” is obviously meant to represent Vegas but also be the stone than the sword is stuck into. The logo is simple enough to be printed at any size, while complex enough to be unique. Troy did an incredible job with these and the NHL would be wise in my opinion to scrap what ever they are working on, throw him a couple million bucks, and unveil these bad boys next week. If Adidas can out do this, we are in for a real treat whenever they do finally announce the name, colors, logos, and sweaters. Can’t wait! Hard to like a two name nickname? What are you talking about, man? You never heard of the RED SOX???? How about the Maple Leafs? Both have one of the biggest fan bases in their respective sports. SILVER KNIGHTS is fine, time to go with it! Incredible. I’d own every version of that jersey. I have been advocating siLVer Knights, siLVerados, siLVerbacks, siLVer Blades, siLVer 17’s, siLVer Miners, siLVer Sonics, etc. for two months now. The logo design could be enhanced more by making the L and V in siLVer pop out more. I know it’s too late but how about MidKnight Maurauders (Pirates) for a tough mean name that the Creator is looking for? 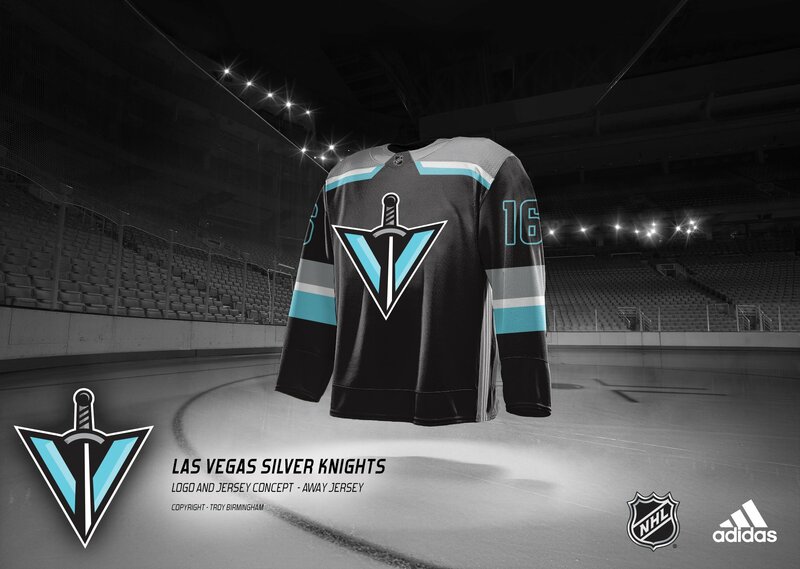 Either way “Hockey Knight in Vegas” will be an effective slogan to advertise game dates if “Knights” is chosen.. 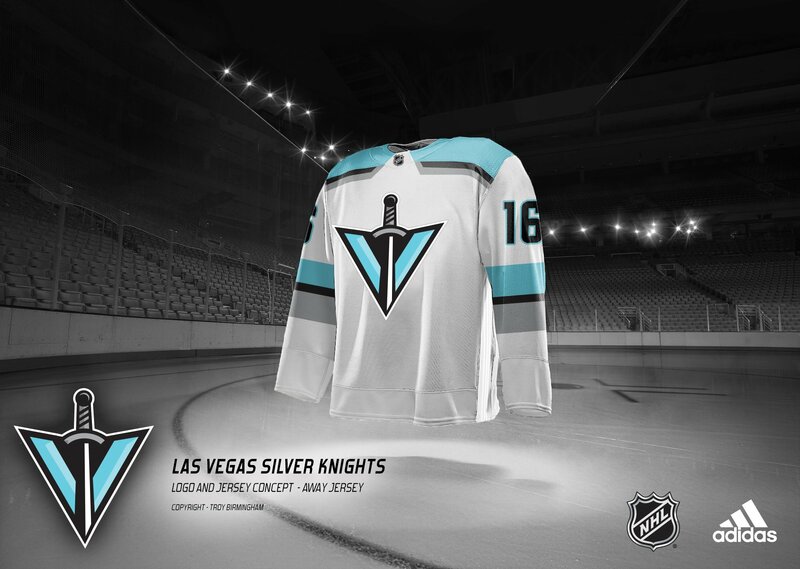 I liked the blue in the original Silver Knights jersey. Well actually I like this one more but it’s too close to the Sharks color in my opinion. What do you think of Team North America and Team Europe World Hockey Jerseys? The Adidas designers were given artistic license to create. Both logos are simple but nice. The Team North America jersey is a little unorthodox. I expect something similar from Adidas. @James Kind of like them, but I agree the Europe one looks better. The blue colors look good. How about the KnightHawks so you have both of the Knights and Hawks together that would be.unique and also dynamic? Those are the best jerseys I have seen yet, clean lines, bold edges, sharp yet soft, incredible work! I sure hope its Silver Knights. Hey Ken or Troy any way to work the name Silver and Knights into the V say Silver running down left side of V and Knights the right? Not sure how it would look just throwing ideas out there. Certainly could happen, but Troy wanted to make the standard design simple. If you look at most NHL logos, there’s no lettering. Not a fan at all. The colors are too close to Sharks colors, the V with the swors coming through looks falic and the name it self is blah. This is an epic design? Say it isn’t so. From what I gathered, Foley wants black, gold, silver color scheme, similar to his army knights/west point background. I like the blue but not as a primary color. If it’s used, it’ll be for the piping to make the colors pop. Personally, I still think it’s all a smokescreen to get scorpions trademarked. As a self described expert on jerseys.. that emblem and icon for the team couldn’t be more Boring.zzzzzzz…. a knights helmet with swords.. boom.. easy.. But the design of the shoulders is epic.. But the blue needs be more Blue Jacket and less Shark.. I really like it. Using the sword and the V works. As far as the color is concerned, Sharks are teal, this is light blue. Side by side the colors would look completely different. Not an issue IMO. Perhaps I’m colour blind but I see a colour resembling powder blue! I’ve never mistaken the powder blue San Diego Chargers for the Miami Dolphins, who play in teal. Granted the Sharks original sweater is closer with colour. According to Wikipedia, they currently play in Deep Pacific teal. A scimitar sword seems more appropriate if/when Desert Knights is chosen. A scimitar is a backsword or sabre with a curved blade, originating in the Middle East. The Desert Knight Batman Action Figure I came across comes equipped with whirling scimitar swords. I assume that the Tampa Bay Devil Rays could have been called the Tampa Bay Rays from day 1. I don’t know if we can wait a year or two and drop the “Silver” or “Desert”…I don’t blame him, but I get the impression that Mr. Foley won’t even entertain the idea of buying a team name. Call me skeptical, but I think Mr. Foley would be more receptive to Las Vegas Knights if it was actually available. I predict that the team will change their name after Mr. Foley eventually sells the team. It’s a no-brainer if the team on the ice can’t get out of each other’s way. It might take a Stanley Cup for Desert Knights to stick long term. 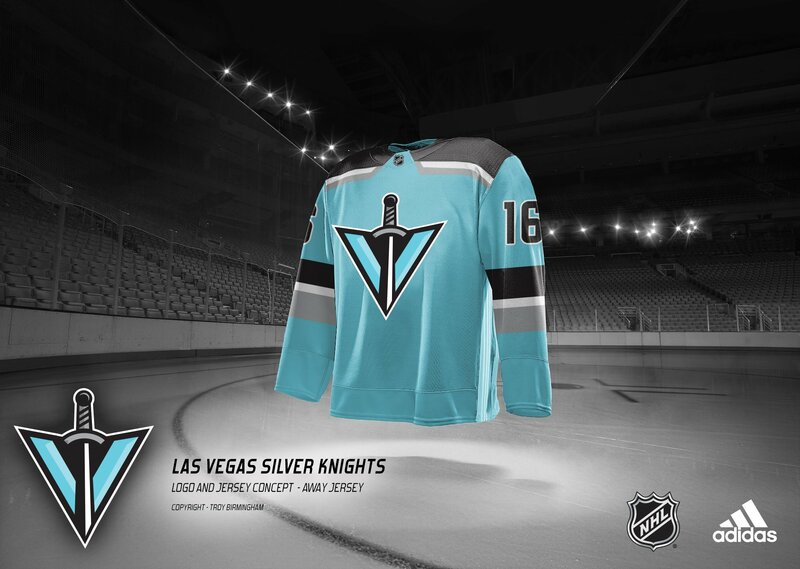 Is this the jersey for the Las Vegas Wintergreen Swords? Decent if so. That sword looks more like the Stratosphere than a sword. I thought they had Nighthawks set aside too ?